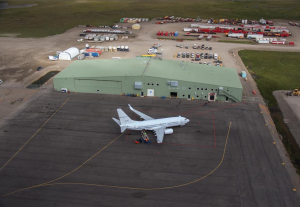 The project consisting of a 67,000-square foot facility on Alaska’s North Slope that included a 20,000-square foot aircraft hangar, 47,000 square feet of offices, 24 individual living quarters, a full commercial kitchen, and cargo handling facilities. This facility also includes a medical facility and indoor ambulance storage. The design allowed for: 65,000 gallons of fire water storage; hydronic heating systems; constant volume ventilation systems; in-floor radiant heat for living areas and offices; and, snow melt for entries, the hangar door, and all overhead doors. Since the facility is located in an area with no water distribution, domestic water storage and on-site waste disposal were also provided; these two systems require special design considerations to provide domestic water at the proper pressure, they also provide lift stations to remove the waste from various areas throughout the facility.